Today, the last Sunday of the Church year, we reflect on two things: Jesus Christ as our King and the conclusion of the Year of Faith. We proclaim Christ King of the universe because He is the only way to eternal life -- to salvation. He is a patient, merciful King, giving us more than we need to combat temptations and to cooperate with his help. He is the center of the universe and should be central to our lives. When we accept Him as our Lord and Savior, we have real happiness. This is a happiness that is not relegated only to the afterlife, but it is here and now. 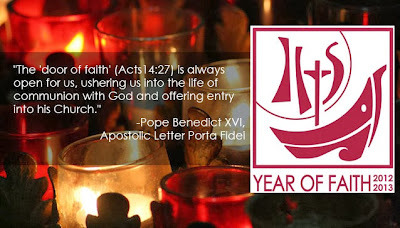 Pope Benedict XVI declared a year of faith last October. The purpose was to encourage everyone know what our faith is. The faith reveals God's words, his teaching, to us. Essentially the Faith is explained in the Catechism of the Catholic Church which we should have in our homes to read and reference. Knowing our faith enables us to have a deeper and more personal relationship with God. Along with divine grace, we can live better, upright lives. Having a firm grasp of the faith leads us to share it with others. This is evangelization. We cannot keep silent with such a treasure in our minds and hearts. So, today, in our Cathedral/Basilica there will be a solemn Mass concluding the Year of Faith. Surely, there will be similar Masses in dioceses throughout the world including St. Peters in Rome. We pray, in addition to our prayers of the last 12 months, that all Catholics keep on making the effort to learn the catechism, to interiorize these beautiful truths and to share them with everyone. When we celebrate Thanksgiving this Thursday, let's not forget to thank our Lord for the gift of faith as well as for the very many blessings He has given us. May you have a truly wonderful Thanksgiving.